Hello Friends, It’t been a fast week for me! 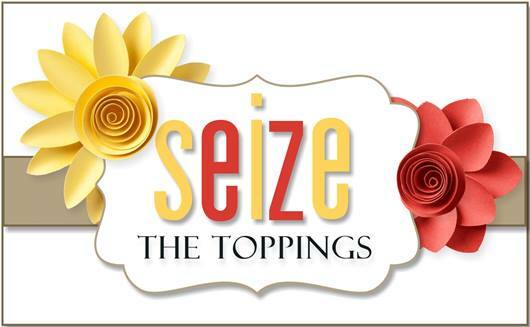 It’s already Thursday and time for our next Topping at Seize the Birthday! What we have going on over there is to add Dashes and or Doodling to your card and or project. I think our players are going to enjoy this topping…I know I sure did. I took the same Altenew stamp set (Botanical Garden) that I still had sitting out in my studio and went to work. I think the added dash lines around the flowers and leaves really made it look totally different! I don’t think my coloring turned out as well this time as last time though. I tend to struggle with blending the color red. Now, you may ask …why I decided to use the color Kraft for my leaves. I got mixed up and started this card for a different challenge and then remembered I was making it for STB….please tell me you have done this at least once? I tend to do it often. LOL So many challenges…so little time! I had some pencil marks I couldn’t get off of the white card stock so I decided to add the dots to hide some of them and carried it down to the sentiment too. I think it turned out rather fun! The sentiment is from Stampin Up. Categories: Cards | Tags: Altenew stamps, Card making, Cards, doodling, Happy Birthday, prisma colored pencils, rubber stamps, stamping | Permalink. Beautiful card Nancy. I think your coloring of the flowers look great and the added dashes make them stand out more. Adding the doodling really dressed up your pretty card design. Love the colors too! Nancy, I love this as much as the yellow one. It turned out beautiful. Fun adding the dashes, it really steps it up a notch. Great card. Oh my gosh, Nancy, I LOVE this card. The colors are gorgeous, your design is amazing, and then the doodling. The perfect final touch….well done, I’m pinning!!! Your card is so gorgeous Nancy! Great job! Have a Blessed day! 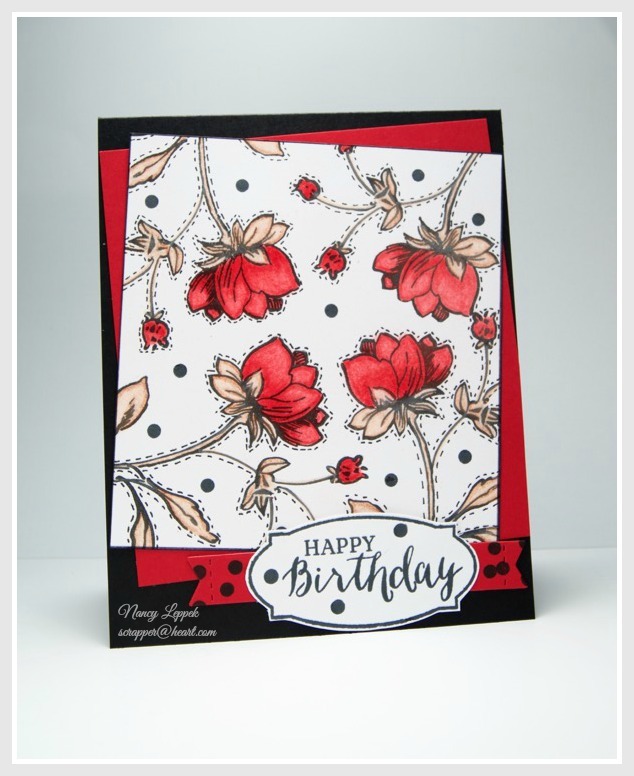 What a chic card design with red, kraft and black! I think the brown leaves and black dots were superb touch Nancy, even though they weren’t your first plan! Have a wonderful day! Wow, Nancy this is absolutely fabulous! Love the colors, your placement of the flowers, and the dashed outlines are amazing! Your card is simply lovely!!! I think your coloring is wonderful indeed!! The dashes around everything is the most ingenious way of incorporating dashes in. And yes… I’ve balled up cards so many times, specially when working on several challenges. Hope you have a super creative week! All I can say is wow – this is stunning. Love it!